A project to better understand the nature of seismic events relating to hydraulic fracturing and water disposal in the Montney Play, to develop new monitoring methods and to find new ways of reducing and managing risk. With the potential for shale gas extraction in northeastern BC to increase in coming years, there is a need to increase understanding of anomalous induced seismicity (AIS) associated with hydraulic fracturing and wastewater disposal. This will help to address public, environmental and safety concerns as well as helping to develop protocols to manage and mitigate the risk of seismicity. Further develop understanding of the variables and processes controlling AIS due to hydraulic fracturing in the Montney, in order to prevent and mitigate the magnitude and occurrence of induced seismic events. Optimize hydraulic stimulations and well design for shale gas production in the Montney. Monitoring and improving knowledge of seismic events in northeastern BC helps to reduce and manage risk. 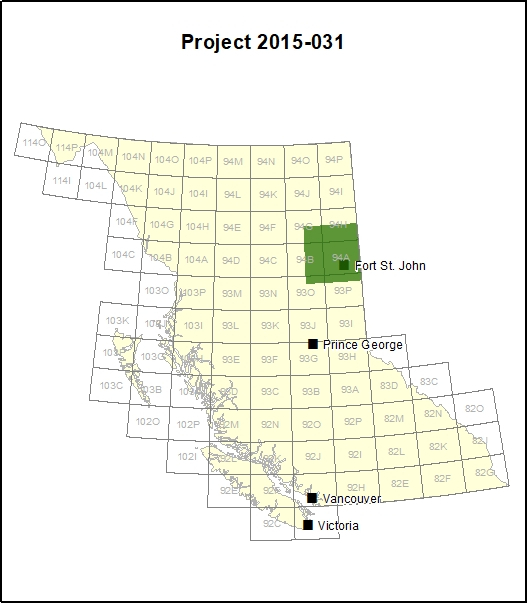 The project includes monitoring well pads in the Montney using specially-adapted low cost and mobile sensors that have been developed for British Columbia’s earthquake early-warning system. This will play an important role in providing the BC Oil and Gas Commission’s (OGC’s) collaborative monitoring model with efficient, accurate and inexpensive sensors. The data gathered will be used in the development of a ‘traffic light protocol’ (TLP) for seismic events in the Montney. This will consider the intensity of the ground shaking, not the magnitude of a seismic event, as it is this that is felt on the surface and causes damage. The project will also simulate a ‘worst case scenario’ to understand what could cause such an event, and develop new protocols to reduce the likelihood of such an event. The Montney Play, Northeastern BC.